One doesn't immediately associate Latin America with 'early music'. It is amazing, though, how large is the repertoire spanning the 16th to the 18th century. It can be found preserved in archives, libraries and local churches all over the continent, from Mexico to Argentina. What is even more astonishing is that parts of this repertoire are still played and sung by people there - often of native origin - and the fact that they still use instruments from the baroque era as if nothing has changed since those days. Exploration of this repertoire began only about a decade ago. One of the pioneers in this field is the Argentine Gabriel Garrido, who with his ensemble Elyma has made a number of recordings with music from Latin American sources, mostly on the French label K617. The quality of this repertoire and its popularity among European audiences is such that other ensembles and musicians are also looking into this kind of music. 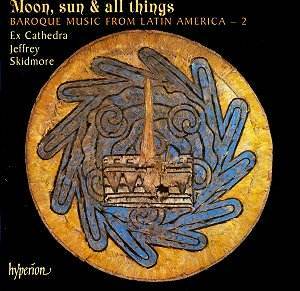 One of them is Jeffrey Skidmore, who recorded two discs with Latin American music. This disc is the second of them. The music of the European renaissance and baroque came into Latin America in the wake of the colonisation of the continent by Spain. Some Spanish composers went to the New World, but it isn't always known exactly why. One of the earliest was Hernando Franco, also represented on this disc. But the emigration of Spanish composers was mostly connected in one way or another to the process of christianisation which went hand in hand with colonisation. The key role in this process was played by the Jesuits. For them music has always been an important means to further the dissemination of the Christian faith. As they travelled in the New World America they took with them music they used to perform at home. Some composers were Jesuits themselves, like Domenico Zipoli. And the role of music in the activities of the missionaries also meant there were opportunities for composers to find employment. Local people were instructed to sing and play, and also to compose themselves in their own language. As the Catholic church always made use of local traditions and culture to bring people closer to the faith, we find several villancicos here, which are described by contemporary writers as "sacred entertainment for the masses". "The structure of the programme follows that of the Vespers Service, with the opening Response, three polyphonic Psalm settings (...), a Hymn and Magnificat. The plainchant antiphons are those set for the feast of St Ignatius Loyola, the founder of the Jesuit Order. In between these liturgical works I have placed popular villancicos with Spanish texts and sacred motets with texts in Nahuatl, the language of Aztecs", Jeffrey Skidmore writes in the booklet. The music on this disc spans almost two centuries: the earliest was composed by Hernando Franco - mentioned above - and Francisco Hernández, the latest by Manuel de Sumaya. This results in large differences in style: the setting of 'Dixit Dominus' by Juan de Araujo is for two choirs, like the 'Laudate Dominum' by Francisco López Capillas, the first Creole composer - descendant of European immigrants, but born in Latin America. This shows the influence of the Venetian polychoral style, which was imitated in Spain from the end of the 16th century. But the music of Domenico Zipoli is quite different: his compositions are set for voices with two violins and bc, the style which was dominating in Italy at the end of the 17th century. It is understandable that Jeffrey Skidmore has turned his interest to this repertoire, and his report in the booklet about the preparation for this recording shows he has invested a lot of time and energy in this project. That is admirable, and the recording leaves no doubt that he has been able to pass on his enthusiasm to the singers and players of Ex Cathedra. The result is well worth listening to, in particular the liturgical sections of the programme. I wonder, though, if the plainchant should be sung so slowly as in this recording. In regard to the villancicos I feel these interpretations fall a little short of what one may expect them to sound like in the throats and hands of native Latin Americans. Just as the Italians have given a wholly different perspective to the way Italian baroque music should be interpreted, I can well imagine performances by Latin American musicians would reveal the true character of this repertoire and unleash its emotional impact. It isn't just that the performances are a little too distant - only in the last villancico, '¡Ay, andar!' by Juan de Araujo, all musicians involved let their hair down -, but also it is to do with the colour of the voices, which are 'whiter' than Latin voices. These reservations don't hold me back from recommending this disc. The repertoire is fascinating and often exciting, and the interpretation by Ex Cathedra is good enough to convince the listener that it is worth exploring further. One has to hope we will see and hear Latin American performers taking on their own music in the future.